In 2011 Cornwall Council was one of a number of authorities which received an FOI request from the Daily Telegraph asking for details of “credit card spending”. Most of the larger authorities refused to provide information, saying they did not use credit cards. While Cornwall Council also does not use credit cards, the finance team provided information relating to spending on payment cards. Unfortunately some of this information was inaccurate, including details of visits abroad by schools with the costs listed in local currency rather than stirling. This suggested the authority had spent thousands of pounds on meals in Thailand, along with other items such as fish tanks (provided for a children’s centre) and silk ties (available for members to buy at no cost to the public). 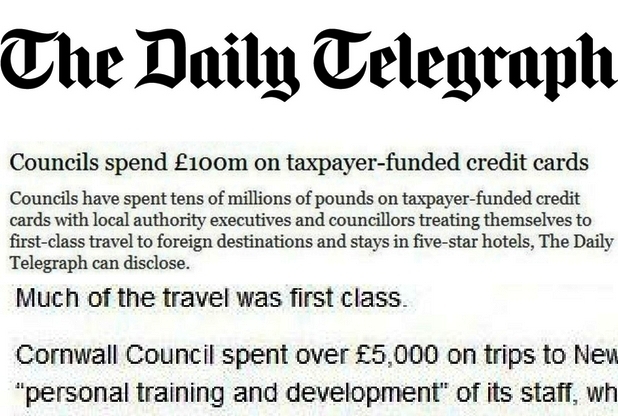 The resulting article alleged the council was responsible for the most excessive spending of all the authorities which responded, wasting £9 million on “luxury taxpayer funded trips” and restaurant meals. This led to calls from national, regional and local media asking for information on 49 specific payments. At the same time opposition councillors and MPs began criticising the Council publicly on blogs. There was a real danger this could turn into the council’s version of the MPs expenses scandal, with new examples of so called “inappropriate spending” appearing each day. After recognising the potential reputational damage Trisha immediately ensured that councillors, senior officers and key partners, including Cornwall’s six MPs, were briefed. She then issued a strong media statement making it clear that the information published by the paper was inaccurate. This was followed by broadcast interviews by the council leader. Trisha then contacted officers to get a detailed explanation for all 49 payments. By the end of the day this information had been compiled and sent to all members and the media, and then published on the council’s social media channels. This quick action effectively killed the story, with the 123 mentions in the media on the first day reducing to just five mentions on the following day.